These days the weather is getting colder, and I am hesitant to leave my blankets. Therefore, I am introducing 'The Space 17-Gyeongju 2017' by artist Soonim Kim, which gives viewers a warm feeling, as the front page artwork of the last newsletter of the year. 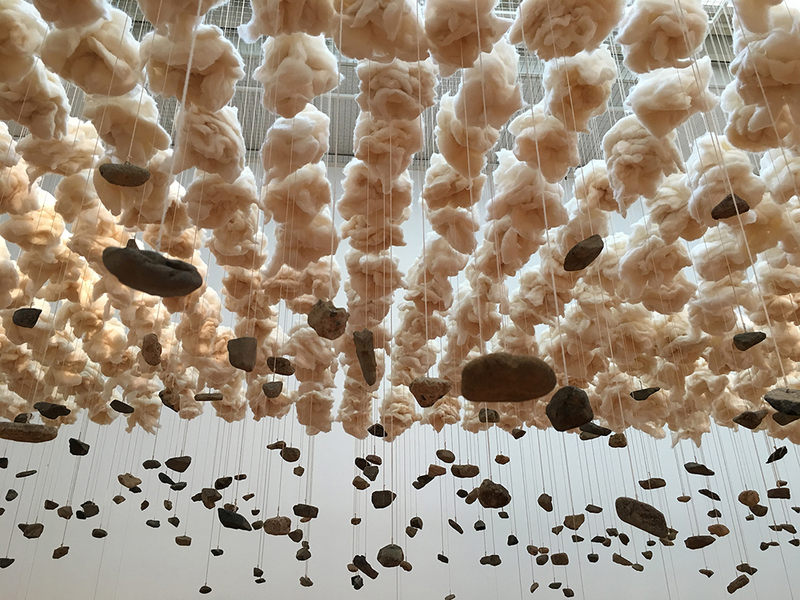 This work was installed by hanging cotton yarn from the ceiling, from which the artist hung cloud-like clusters of cotton at the halfway points, as well as stones at the ends which were collected from Gyeongju. It was displayed at the exhibition entitled 'Meta-scape' from June 99th to October 8th, 2017 at Wooyang Museum of Contemporary Art located in Gyeongju. 'The Space' is an installation that incorporates local stones based on the location of the exhibition and was first displayed in 2007. Though this work is installed inside, it inspires viewers to picture the outside landscape while indoors. 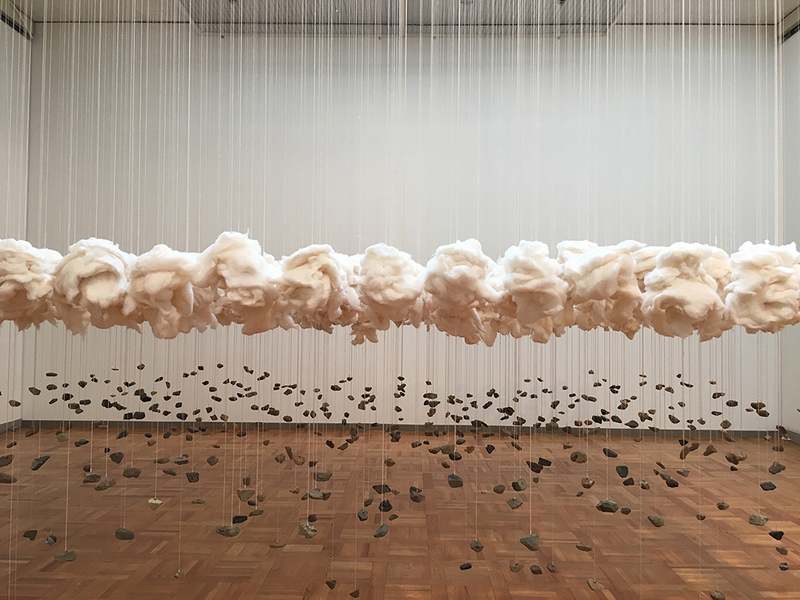 Artist Soonim Kim explained that the work evokes both a landscape and the undersides of a blanket. "I was in the United States in March of 2006. Outside of my window, everything was covered in snow even though it was already March, and it looked as if the earth was covered with a blanket. The weather was cold, but due to the March sunshine, it looked very warm and the rays of sun seemed to pierce the ground. It gave me a sense of the world being covered by cotton, yarn, and light. The feeling was so strong that I made drawings and created installations to express it. When we are in a certain space, we usually think that the area is really big, but what if I were to weave the highest space into the lowest space? When stretching the two sides of a blanket, it looks like both pieces of cloth are woven with fibers and that the inside is stuffed with cotton. As I looked at that, I was able to imagine the environment within a blanket. A detailed view of the installation, 'The Space 17-Gyeongju 2017,' as seen from above. 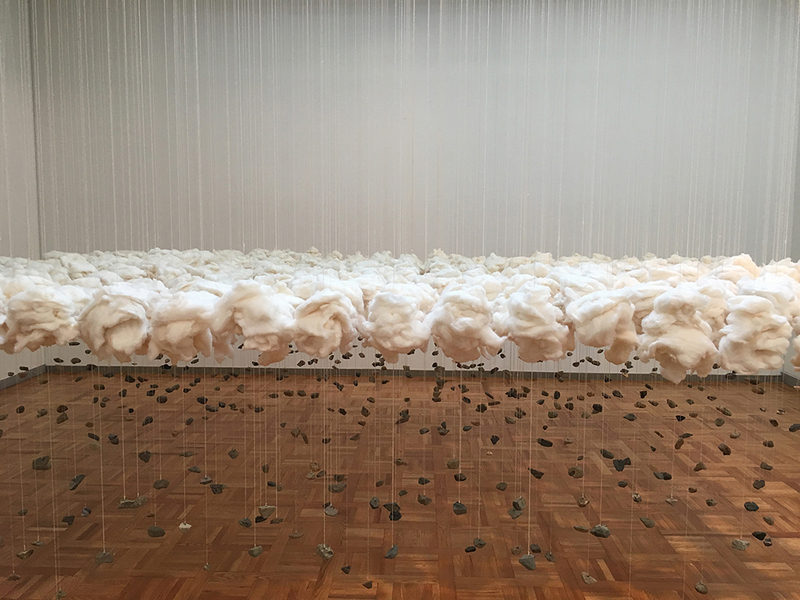 Just like the artist used stones from Gyeongju, where the exhibition was held, every time she creates new work, it is region-specific and uses materials that the artist encountered in the area. Another one of artist Soonim Kim's interests is in minimizing artificial intervention in her work. 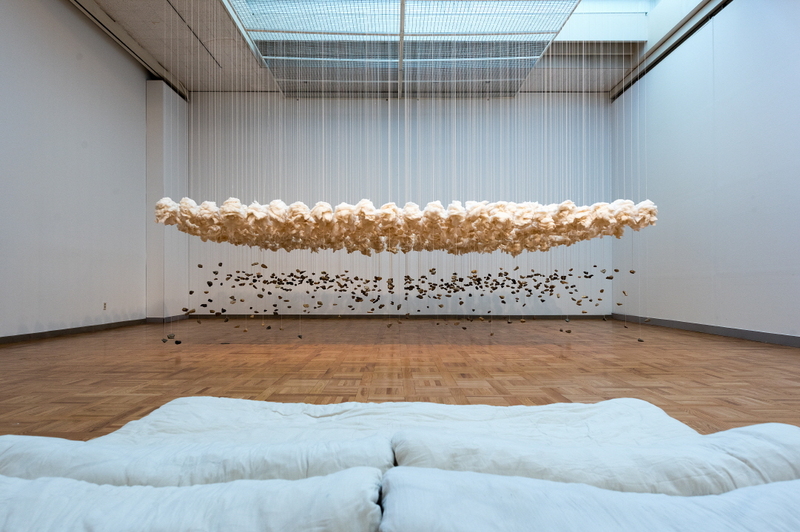 Also, artist Soonim Kim said that she does not like to use materials in order to deliver a certain message or discuss an issue. Instead of saying that she uses the materials for her work she uses the expression that she meets with the materials on site. It means that she wants to meet and deeply connect with natural objects, discovering their hidden qualities in the process and sharing those with viewers. "The objects that I bring to exhibition halls have their own stories in nature. One of the goals of my work is to depict those stories more clearly with the least amount of intervention. Stones and cotton, for example, created their own colors by accepting the energy of the earth after they were created in nature. The feeling that I get from meeting the objects or the materials, which have their own colors and stories, is important in my work. However, this does not mean that my own story is absent from the work. It is included, but it is not a central part. I say that I meet the materials because I do not use the natural materials for my work, nor for telling the stories of nature and its materials. My style of working is to tell a story through the cross section of these two concepts," the artist explained. A detailed view of the installation, 'The Space 17-Gyeongju 2017,' as seen from below. Due to the characteristics of her work, she travels around many places. Her philosophy is that even if she stays in a certain place for a short time, she adopts the attitude of living forever in that spot. "The concept for my work comes when I stay in a place as if I am going to live forever there, observing and analyzing the flow of light, air and the direction of the wind. There is a point at which it is hard to distinguish between what is my work process and what is not, and then I invest my time, sincerity and experiences in a place and that becomes my work. A few days after the interview, artist Soonim Kim went to Gujing, China, in order to attend 'The 1st Gujing Nature and Art International Residence Creation Exhibition,' which was planned by organizers from Korea, China, and Hungary. Text and images may not be reproduced, reprinted, or redistributed without express consent.